Unlike the incoming administration, the Obama White House has been fairly consistent in its friendliness toward technology and Silicon Valley. Its latest attempt is no different, except this time, it’s going after the future leaders of America. That’s right, teens: The White House wants you. The latest endeavor comes in the form of an app called 1600. It appears to be an attempt at replacing every boring high school lesson on White House tradition—it’s basically a tiny, “interactive” version of 1600 Pennsylvania Avenue. 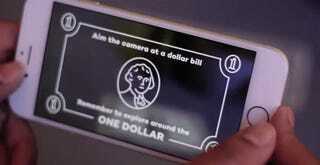 Users can train their smartphone cameras over a dollar bill, and a 3D version of the White House pops up, complete with a brief history narrated by the dulcet tones of White House Press Secretary Josh Earnest. I can think of plenty of other things I would have preferred to spend my time with as a fifth-grader, but anyway! The app was created by UK-based Nexus Productions with help from the White House Historical Association, and we’re told the company received no payment for its contribution to molding young minds. 1600 joins the White House’s previous efforts at looking hip, like that weird Facebook chatbot and Obama’s forays into virtual reality. It still hasn’t lived up to that time Malia Obama allegedly played beer pong, however. Better luck next time!